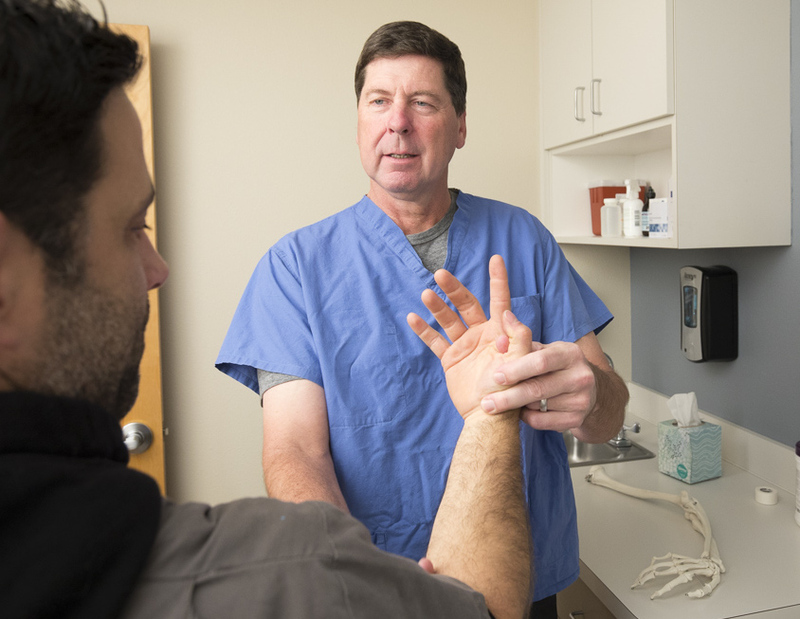 As an orthopedic surgeon, I talk to patients about their treatment options all the time. It’s surprising how surgery tends to be first-and-foremost on many patients’ minds. Often it seems some are looking for a quick fix, either a pill to fix the pain or a procedure to fix the injury. Others are so afraid of surgery – and the cost and recovery time – that they put off medical care and suffer much longer than needed from their injuries, unaware that they could get effective nonsurgical treatment. In reality, the body has an amazing ability to heal itself. There are lots of effective alternative treatments that I prescribe that help bolster the body’s ability to heal itself naturally, treatments such as chiropractic care, acupuncture or physical therapy. Chiropractic treatment is helpful for both traumatic injuries – think of the impact of a car accident or a sports injury – and also repetitive motion injuries. Those are injuries that happen over time by doing the same motion over and over – like swinging a golf club – or even slouching all day at your desk. In particular, some minor injuries to the spine, neck, shoulders, or persistant pain can benefit from chiropractic care. Trauma, injury, repetitive motions and slouching at your desk can move the bones of your spine out of place. When the vertebrae are out of place, they can put pressure on your nerves, causing pain and preventing you from fully recovering from your injury, that is, functioning normally without pain. A chiropractor adjusts your vertebrae to return them to their proper position, removing the pressure from your nerves. A double-blind trial divided patients into two groups: those receiving chiropractic treatment and those receiving “simulated” chiropractic treatment. It concluded that chiropractic treatment is effective for pain relief for acute back pain, sciatica and disc protrusion. In other words, chiropractic care is not providing a placebo effect, it genuinely reduced the pain levels in patients. The overprescription of opioids has led to an addiction health crisis. Acupuncture provides a non-addictive way to treat pain. Acupuncture is an ancient practice originating in China thousands of years ago. Although many ancient medical practices have no medical benefit, acupuncture is different: studies have shown that acupuncture is an effective treatment for pain. Doctors and scientist still don’t fully understand why acupuncture works, but in general terms acupuncture stimulates the nervous system in a way that calms patients’ pain and revitalizes the body’s ability to heal itself. Acupuncture also releases endorphins, which interact with receptors in the brain to reduce pain. Some patients are afraid the needles will hurt, but the needles used in acupuncture are so thin most people feel only a slight pricking sensation, tingling or pressure. Once the needles are in, those sensations fade. Some patients find the process of acupuncture treatment itself calming. When you have an injury, there’s a good change you’re going to end up doing physical therapy. Sometimes physical therapy is more or as effective as surgery. A recent study concluded that when it comes to rotator cuff surgery, physical therapy on its own was just as effective at treating the injury as surgery and physical therapy combined. Physical therapy can help patients with traumatic injuries or repetitive motion injuries. The goal of physical therapy is usually to improve range of motion and regain strength. A physical therapist will teach patients specially designed exercises, movements and stretches; and then help track progress and modify movements as necessary to help patients fully recover from their injuries and get back to their normal life, sports and activities. As a patient, it’s smart to be educated about your options. Not all physicians are going to give you a referral to treatment alternatives like chiropractic or acupuncture. Sometimes you need to ask whether these treatments may be right for your injury. Often your insurance includes coverage for some or all of those treatments, and if you’re in a car accident, Personal Injury Protection (PIP) definitely provides coverage for these treatments, whether or not you’re at fault for the accident. If you’re hurt on the job, in Oregon you have the right to choose your own doctor and your care will be covered by your workers’ compensation claim. No one plans on getting injured. It’s always stressful and unexpected. Getting educated about your treatment options, and what your insurance will cover, before you or a loved one gets hurt will make that injury a little less stressful. If you are injured, consider visiting Go To Ortho, the only immediate injury care clinic in the Portland metro area. No appointment needed and no referral needed. You can walk in and be seen by an orthopedic specialist immediately, or contact us for more information.